The preliminary investigation revealed that a 1996 Toyota Camry, occupied by only the driver, was travelling west on Mountain Road, crossed into the eastbound lane and struck an International bucket truck head on. 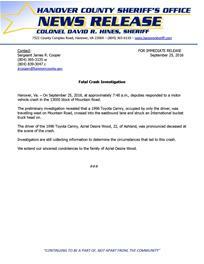 The driver of the 1996 Toyota Camry, Azriel Desire Wood, 22, of Ashland, was pronounced deceased at the scene of the crash. Investigators are still collecting information to determine the circumstances that led to this crash. We extend our sincerest condolences to the family of Azriel Desire Wood.